Long-serving Marlborough section leader Paul Rennie may be retiring from his day job but he’s still flat out for AREC. Julia Mahony caught up with Paul as he prepared to celebrate with family and friends. After decades working for Marlborough Lines, Paul is retiring as senior lines foreman early next year. He started with the local power authority in 1969 and it’s time to flick the switch on all-weather, round-the-clock call-outs. 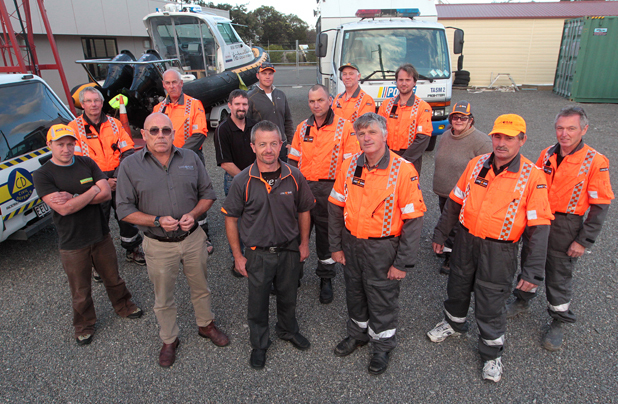 However, there’s little chance of Paul ending his valuable service with AREC, assisting during many high-profile LandSAR and Civil Defence operations over 40 years. He’s been through bush, mountains, and city for search and rescue. When AREC Today phoned Paul at his Blenheim home, it took this modest man a good while to reveal it was his 65th birthday. He and wife Sharon were preparing for a ‘shindig’ on their lawn with family and friends, including AREC members he’s worked with over the years. Paul claimed his cell phone would be turned off for the weekend, although it seemed unlikely for someone so committed to search and rescue assistance. There have been memorable search and rescue events, such as two young day walkers rescued from the Richmond Ranges west of Blenheim in July 2015. They were located via their cell phone. Three AREC operators Paul, Stuart Watchman, and Ken Hynds – call signs ZL2RE, ZL2TW, ZL2KHZ – maintained an operational watch for police, with six Tait handhelds working through a local authority VHF repeater. The operation started on a Sunday evening and progressed till about 0630 next morning with the arrival of the search team with the stranded party at Blenheim police station. The AREC team’s careful log keeping and local knowledge was of great use during the 11-hour operation and AREC received special credit by the media. “If they hadn’t had a cell phone, no one would have known who, or where, they were and the search would have become a lot more involved, with the possibility of two deceased persons,” Paul says. Personal locator beacons would have made the job even easier. Paul’s witnessed great advances in mechanics and technology, such as the arrival of the new air force NH90 helicopter, demonstrated at a SAREX at Lake Rotoiti. “The night flying was something special. There were bright green LEDs at the end of the rotor blades, creating a green circle coming through the black sky.” Aside from the technical aspects of assisting field teams locate missing people, Paul’s learned equally important skills around communication during fraught rescue missions “Wearing headphones during sensitive transmissions, as the distraught family may be standing close enough to hear incoming updates,” he notes. One thing worries Paul, getting young blood to follow in the footsteps of long-serving AREC members. “It’s getting harder to secure volunteers because of their own work commitments,” Paul says. “Especially young people – we’re trying to get radio projects into schools and classrooms, to get them interested – some NZART branches are doing just that.” Current Marlborough AREC members range in age from early 50s to mid 70s and include an A&E doctor, farmers, and retired folk. Pauls says he’d go mad without AREC after retirement. Apart from SAR operations, other highlights over the years have included an eight-day South Island communications road trip for the Silver Fern car rally. Paul took to the road helping to provide communications and along the way was joined by AREC members in Picton, Greymouth, Banks Peninsula, Fairlie, and Roxburgh. Rally events are a good opportunity to exercise for AREC, providing communications under field conditions while maintaining interest for members. “We would pick up section leaders in each area, fill them in on what was required and work together,” Pauls says. “It was great fun. We were allocated start and finish positions and would transmit the cars’ times back to radio base in Blenheim.” He’s looking forward to the next rally in late 2016. To relax, Paul takes off into the bush with his brothers-in-law for a week at a time. “We’ve done the six great walks in the South Island and next year it’s the Otago Rail Trail and the Tongariro Crossing.” Paul likes to keep busy, just like his father, who at 91 lives alone and chops his own firewood. “I keep an eye on my weight and don’t overindulge. I get a WoF like a vehicle every 6-12 months.” Let’s hope Paul’s 65th shindig didn’t keep him out of ‘range’ too long.